Since 1999, altE has offered customers across the globe solar panels for their homes, cabins, RV's and boats. We carry leading brands such as SolarWorld, Seraphim USA, Canadian Solar, and our own altE solar panels. See our full list of solar panels for sale below. Not sure where to start? Check out our Solar Blog, off-grid sizing and grid-tie sizing calculators - great resources for beginners to the most experienced. Want a custom designed solar power system for your home? Give us a call at 877-878-4060 and our trained solar professionals will work with you to design your own home solar system for FREE! The term solar panels is often used for a few different types of products that produce energy by collecting sunlight. We most commonly use the phrase to refer to the type that converts sunlight directly into DC electricity. Less frequently, people will use the term in reference to solar thermal collectors, which typically heats a liquid such as water, or solar air heaters, which heats air directly. Rays of sunlight hit solar cells, pushing the electrons in the cell through the wires to create electricity. This electricity is in one direction, so it is called DC, for Direct Current. As opposed to AC, for Alternating Current, where the electrons are going back and forth 50-60 times (50-60Hz) per second. That is why for most installations, you need an inverter. An inverter changes the DC to AC and makes it usable with your home's appliances. On one side of the solar cell, there's an overabundance of electrons and on the other side there is a lack of electrons. Manufacturers create this static imbalance of charges on the cell by doping each side of the silicon solar cell with different chemicals (e.g. phosphorous on one side and boron on the other). Wires or soldered leads are effectively connected to each side of the cell. The positive and negative wires go to whatever you want to charge or power. Connecting the leads in itself to an electrical load, while closing the current path, does not allow to the electrons to flow, despite the positive and negative imbalance. It takes sunlight hitting the silicon in the solar cells to loosen up electrons. And as soon as they a freed up, they immediately start flowing through the wires to power your electrical loads. The more sunlight shines on the cells, the more electrons loosen up, the more electrical current flows and the more power it produces. Want more? 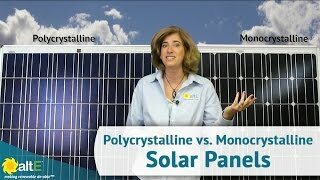 We have created a handy, more in-depth overview of how solar panels work. 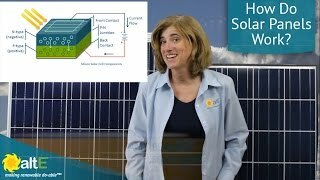 Here, we go into more detail of, not only how the photovoltaic effect works, but also how solar cells work together to create different voltage options, and what all the various ratings in the specification brochures mean. 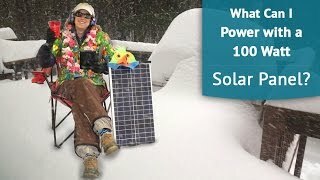 Are solar power systems practical for home owners? We're guessing you wouldn't have come here if you didn't have a hunch they probably were. But just in case, let's review when solar systems are practical for homes and when they're not. If you own home or cabin and you have (or a tiny home who can be parked such that...) a roof that roughly points south (north if south of the equator) with no shading by trees, hills, other homes from around 9AM to 3PM, then you have some prime real estate for putting a solar system on. The cost has dropped significantly in the last several years, making it such that, with tax incentives or rebates, a grid-tie solar system will pay for itself in just a few years. Essentially, for the price of a few years electricity, you get 25 to 35 years of electricity. In fact, solar systems will likely keep on producing electricity at a lower rate for even decades after that. Solar power systems are not practical for locations that get lots of shade throughout the day. That said, with the advent of micro inverters and grid-tie inverters that have DC optimizers connected to each individual solar panel, some locations with a little bit of shading can still be an option.